Sand-cast the old fashioned way, these bell casting sets require filing/deburring, sanding, machining, polishing, and assembly. A detail drawing is included with all bell sets. Designed by Laverne Langworthy of Westerly, Rhode Island. This was the 3/4" scale bell offered by Mr. Langworthy in the 1930s, as well as from Yankee Shop/Friends Models for its popular locomotive designs during the 1938 to 1979 era. After more than 30 years off the market, it has returned for a new generation of live steam hobbyists to build and enjoy. This is exactly the same bell that live steam hobbysists were receiving 80-plus years ago from Langworthy, and then from Yankee Shop. Still sand-cast at a neighborhood foundry, just like the old days. Bow and hanger of sand-cast bronze. Bell cast in yellow brass when available; bronze supplied otherwise. Made in New England USA. Drawing included. Price $42 plus $10 shipping to the USA or plus $25 to Canada. For other countries, please inquire. 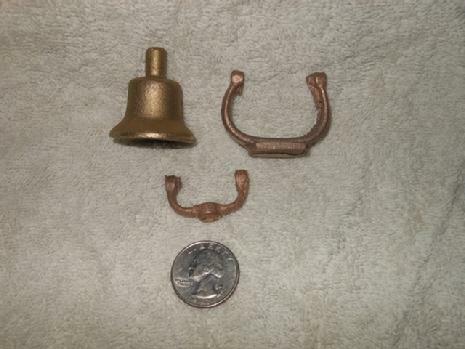 The original 3/4" scale "Yankee Shop" bell set, by Langworthy. Sand cast the old fashioned way so that you may enjoy yesterday's live steam experience, today. $42 plus $10 shipping to USA, or plus $25 to Canada. Please see the Paypal links below, or please inquire about other payment methods or for countries other than the USA and Canada. For USA shipping, please click the Paypal button at left. For Canadian shipping, please click the Paypal button at right.